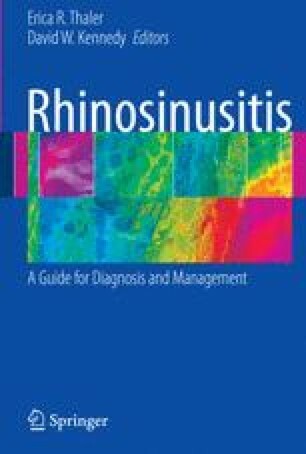 Rhinosinusitis is a broad diagnostic label that encompasses a spectrum of disorders involving concurrent inflammation of the mucosa of the nose and paranasal sinuses [1,2]. The wide range of clinical signs and symptoms associated with rhinosinusitis has complicated the establishment of a working clinical definition. Furthermore, patients with rhinosinusitis may present to a variety of practitioners including internists, family care physicians, pediatricians, allergists, pulmonologists, and otolaryngologists. A standardized definition of rhinosinusitis has been sought to facilitate communication among physicians and to promote uniform reporting of the disease. Such a definition facilitates further elucidation of the pathophysiology of sinusitis, the development of a clinical staging system, and the introduction of new treatments based on robust clinical data .